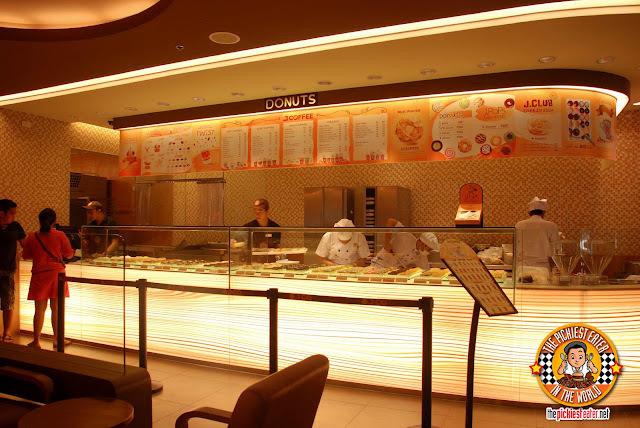 A few months ago, as I was strolling along Greenbelt 3, I saw a sign about this Donut place that would be opening called "J. CO Donuts and Coffee". It's supposedly really big in Indonesia and Malaysia, and they've started opening stores in China and Singapore. Last March 15, Rina and I dropped by the opening of J. Co Donuts and Coffee's first Philippine Branch at Megamall to grab us some donuts, just to see what everyone seemed so excited about. Unfortunately, the line that had formed for the opening was ridiculous, and we were told that if we wanted to buy a donut, we might have to wait around two hours. Yes, you read that right. Two Hours. For a DONUT. 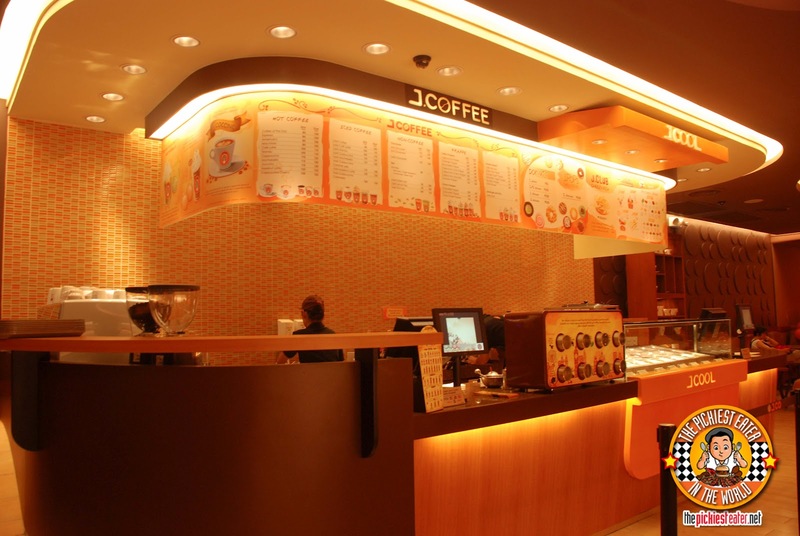 So to call J. Co's arrival here in the Philippines "a success" would be a massive understatement. As you could imagine, I wasn't planning on standing in line that long so I decided to go back the following Saturday morning, where there was a good sized crowd inside but virtually no line at all. 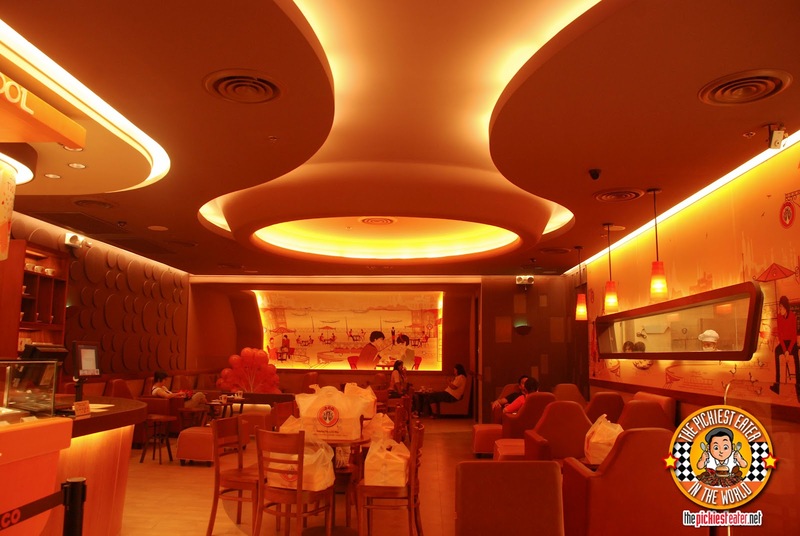 Though the lighting is a bit too orangey for my liking, the place is looks like quite a comfortable and relaxing place to lounge around. When I reach professional blogger status, and I can spending my afternoons writing at home or at coffee shops this would be one of the first places I could think about settling in. As soon as you walk in, you'll see the large counter of donuts on your right, showcasing a wide selection of donuts to choose from. 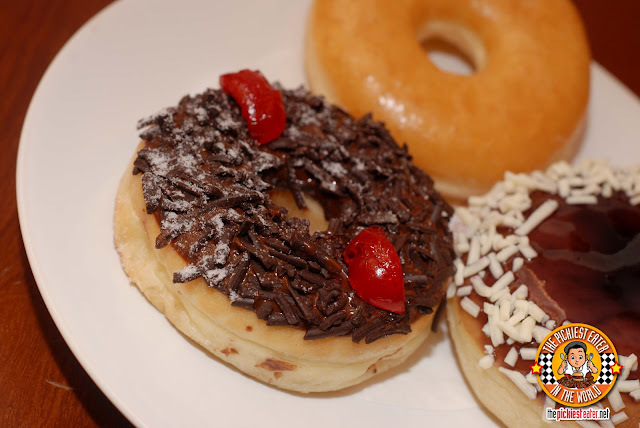 The choices Range from the regular Glazed, to a Black Forest, and even a Green Tea! On the other side, if you just wanna go straight for the their coffees and frappees, there's a counter specifically for that. The signature donut of J. Co's is called the "Alcapone". It's a wonderful smearing of generous heapings of belgian white chocolate, topped with toasted almonds. It was deliciously milky and creamy, and instantly became Rina's favorite. The glazed, or the "Glazzy", isn't very different from Krispy Kreme, but in my opinion (and possibly because it wasn't hot), it wasn't as melt in your mouth. I ordered the Copa Banana for Rina. It was a great medley of a Dark Chocolate topping and rich Banana cream center. Next to the Alcapone, this was one of her favorites. I can't decide which one is my favorite.. the Alcapone or the Blue Berrymore. The donut is topped with Blueberry Sauce, which is sweet without going overboard. White chocolate sprinkles are then gently laid down around the edges. The best thing about this, however was was the cream cheese filling inside it that was the glue the brought together the sweetness of the blueberry and the richness of the white chocolate. Rina and I couldn't resist giving their savory donut, the Mona Pisa a shot. Though it sounded a little strange, we actually liked it. 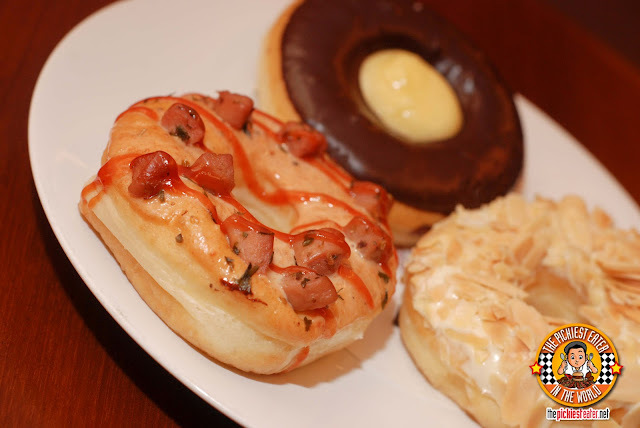 Sweet tomato sauce is drizzled on the donut and topped with little bits of sausage on top. The thought of a "Pizza Donut" sounded strange at first, but one bite will dispel any doubts you may have. It's pretty darn good.. It tastes like a pizza with a slightly sweeter crust. 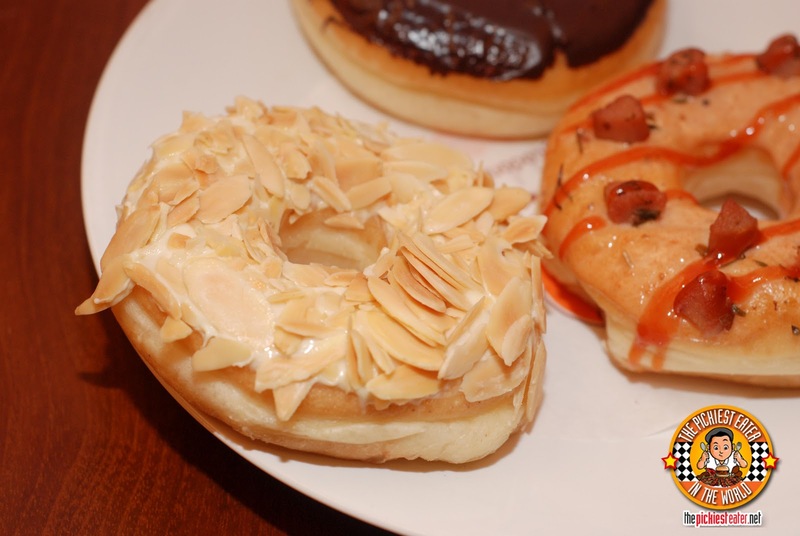 J.Co's selection of donuts is very impressive and creative, and the more important part, absolutely delicious. 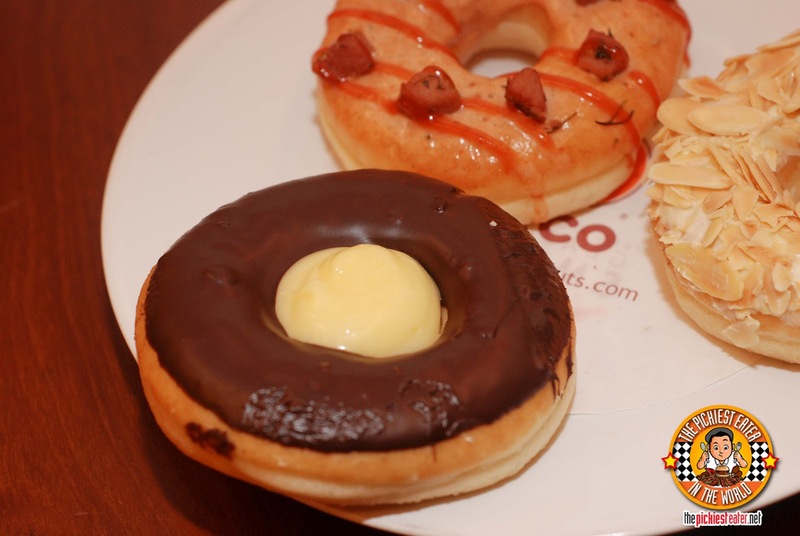 WELCOME TO THE PHILIPPINES, J. CO'S! 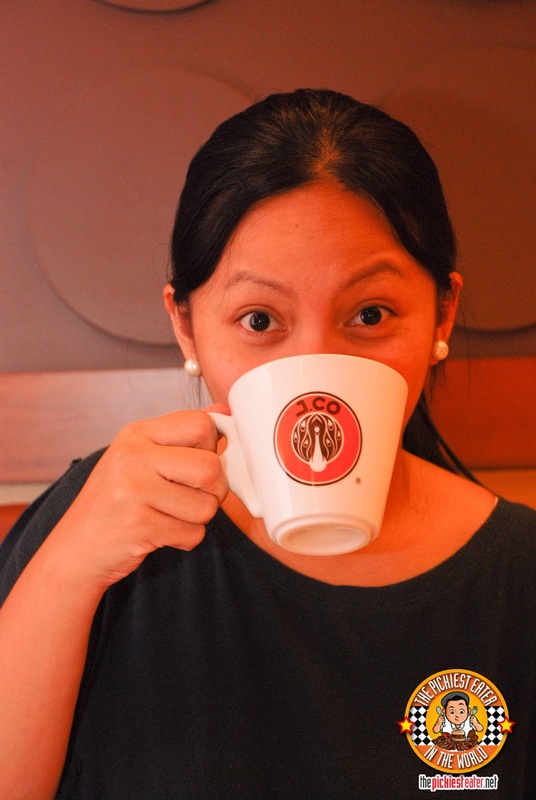 A funny thing happened to us at J. Co's when we were there. When Rina was taking her finally pictures of the place, one of their Indonesian national staff started signalling to her "no" and saying "Sorry! Sorry! ", clearly meaning that photography was not allowed. Rina was oblivious though, and didnt notice the guy. The manager, (I think her name was Rose) saw what was happening and in turn started signalling to the staff that taking pictures was allowed, and the Indonesian national apologized to Rina, but again, Rina didn't notice hehe. Since those were the last pictures Rina needed, we packed our stuff and went to the outside to take pictures of the exterior. Apparently, the manager must have thought we stormed out, because seconds later she came through the door to apologize if we were offended by the Indonesian dude, because in his country, picture taking isn't allowed in the store, but here in the Philippines, they welcome it. I forgot to mention that they also have "Baby Donuts" sorta like their version of Dunkin Donuts Munchkins, only a lot more awesome. 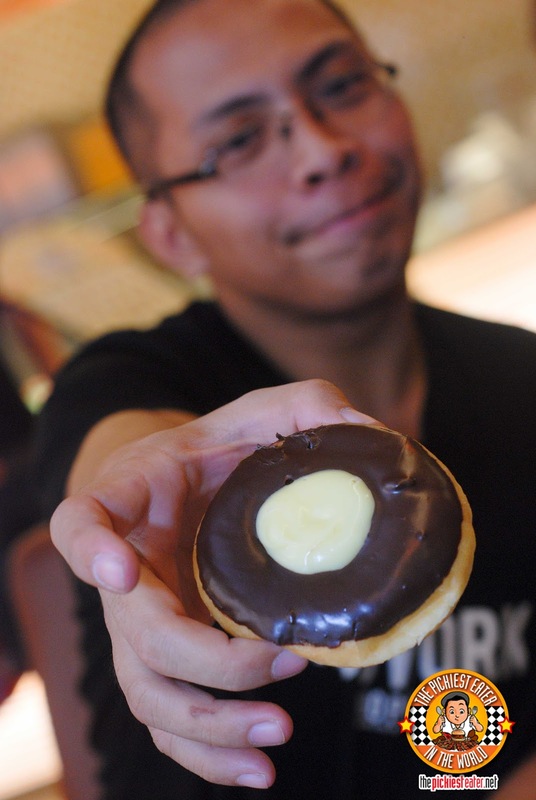 Awwwman been hearing tons of people talk about JCo but I've yet to try it! Definitely trying that Alcapone when I do then! quite yummy, EJ! P42 each isn't far off from Krispy Kreme either..
No dinner tonight + reading this blog post = one hungry mama, haha! These are the times I wish I'm back in Manila . . .food tripping! where you based at, Ana? I tried the cheese one, but didn't like it so much.. or maybe its because I was so full from the big meal i just had and the 6 other donuts I ate before that.. I agree with the Indonesian nationals.. they were very pleasant but a bit difficult to understand. Haha! That might be it. And they said that the Cheezy donut was on an order basis (the like), so when you order it, that's the time they'll bake it. Yeah! 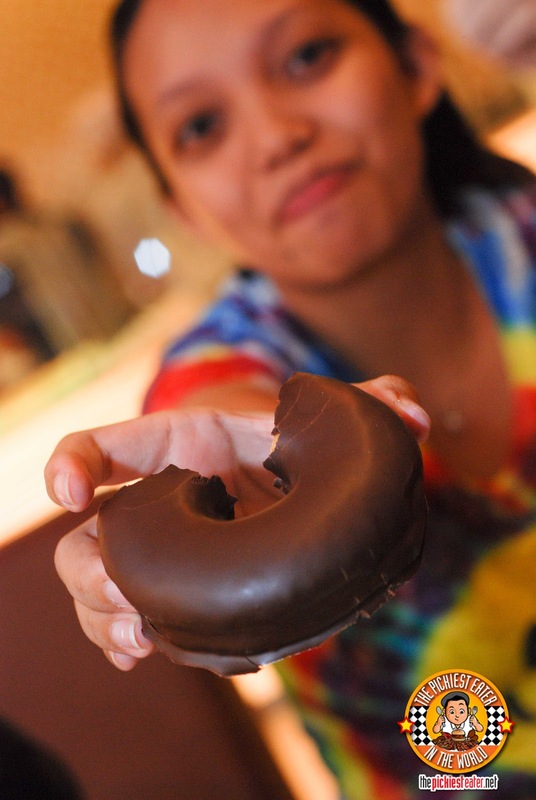 When I was pointing out the donuts I wanted and telling them how many, they passed me on to a Kababayan. Ho wells! Karen you should make a food blog in case you don't have one yet! yes the names add to the fun experience! the family that posts food pix together, stays together!! I love J.Co donuts!! We particularly loved the J.Pops because we can have more flavors we wanted. I can't wait to try their other flavors, particularly the Mona Pisa. haha i know! Im paying for it now though.. my shirts have been feeling a lot more tight fit then usual..
btw, im I gonna see you at Best Food Forward? 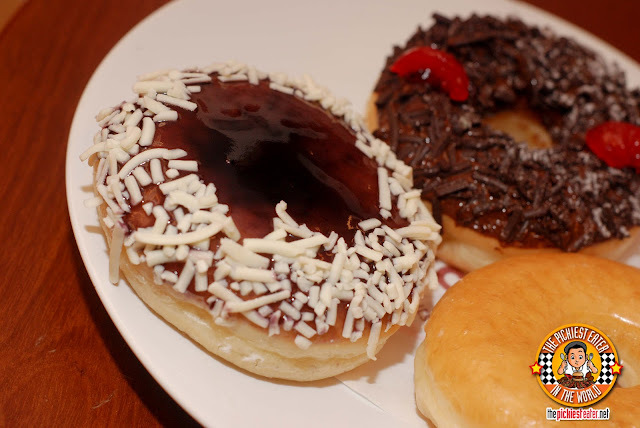 Correct me If im wrong, when tried on ordering heaven berry and the other donut, parang manipis yung dough? Gulat nga ko, pero the filling, sobrang sarap diba? Mr. Jerry, mine seemed ok naman, but yes, the filling of my blue berrymore was quite excellent! haha if we're pooling our resources to buy donuts,count me in!! j.co donut one of the best donut for me,,,but their crews or staff in mega mall sobrang bastos they are not nice to the costumers,,given na mahaba un pila and wala ng donuts sa lahat ng trays one of the costumer asked them miss may donut pa bang lalabas? she answered back na pasigaw at nagulat lahat ng nakapila "WALA mamaya pa"..with matching make face on the side...the lady asked the crew agen,ano yang mga naka prepare na donut dyan sa gilid?MAMAYA pa yan...na pasigaw at galit nanaman...nag titinginan na un mga naka pila na grabe naman sumagot ang bastos...they are ryt,pwede naman sabihin nila na maam sir sorry wait lang po medyo naubusan tayo ng donuts bla bla bla..kaso kung maka sigaw un crew kala mo humihingi kami ng FREE taste,,,dapat kung mag susungit sya duon sya sa KITCHEN or sa palengke nakaka hiya sa mga customers nila..and if u happened to drop by at j.cos mega mall look for joanna..sya un crew na bastos atleast aware lang kayo,,,ang dami na den nag blog sakanila ng ganito,,hope the management will put actions to their staffs. Thankfully I didn't have anything close to that experience.. The manager, in fact, went out of her way to make sure we didn't feel offended at all! Thanks again for the heads up, Chu! we made sure we were there early just to make sure we avoided the long lines.. which is a pet peeve of mine hehe.. I really wanted the greenbelt branch to open soon because it's near my office! Hope you enjoy the donuts as much as I did! was about to buy 2 dozen doughnuts the other day, I asked the server to have the other dozen split into 2 small boxes so that I can give them to my friends. He told me that it is not allowed and that I should buy the half dozen which is 230 pesos. I also talked to the supervisor on duty and she said that it is company policy as they are pricing it per box. If I buy 2 half dozen doughnuts that is equal to 460 pesos, and they sell a dozen doughnuts at 350 and 2 dozen at 550 pesos. I would pay 810 just so that I can have my dozen doughnuts and 2 others as giveaways, paying 260 pesos more just for those 2 small boxes? If the doughnuts came in a tupperware or some other expensive material I would understand. I ended up not buying at all coz I was so pissed off. wow.. Yeah I would be ticked off too! Just tried it recently and I love love love it! The newly opened Greenbelt branch is always packed with people, that they always run out of donuts. My personal favorite is oreology. Haaay! Can't wait to sink my teeth into those donuts! I'm 5wks on the way and you just increased my cravings. I'll go to megamall bukas na bukas din! Hahaha! Haha hope u enjoyed, Mai! May i know what time J.Co in moa opens? Is it open by 8 in thr morning? Thanks! Hi, would you know if they do delivery? 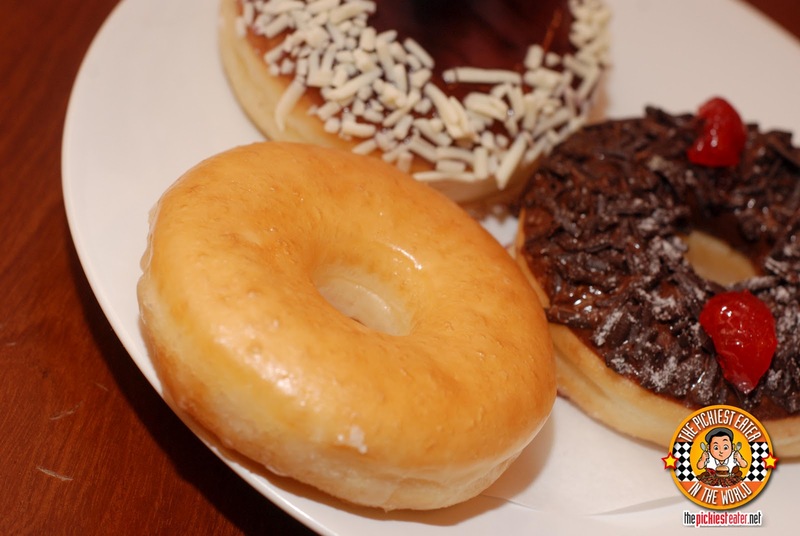 How to not fall in line at J.Co Stores? Read my blog. Thanks for the Share, Dubious! fyi: black forest cakes (or other pastries that are made to taste like one) should really have that strong taste. i believe you're referring to the cherry liqueur. it's supposed to taste like that to cut the sweetness of the chocolate. without it, it's just another chocolate pastry. Yep, I'm aware that the liqueur is what sets it apart from different cakes, and is exactly why I have a dislike for anything "black forest".